New Location: Fort Rouge Glass 58 South Landing Drive, Oak Bluff MB. Fort Rouge Glass has built a strong and reputable business for almost 50 years. They are the leading custom glass company for both residential & commercial customers, as well as offering complete auto glass replacement and repair services. Stop by there newest location at 58 South Landing Drive, Oak Bluff MB. to see the state of the art facility and showroom. Fort Rouge Glass does an array of stunning custom glass work from bathroom products such as custom shower enclosures and bathroom backsplashes to other residential glass products such as kitchen backsplashes, custom glass railings or a custom mirror built at there facility to the exact measurements you need for that perfect addition to your home decor. 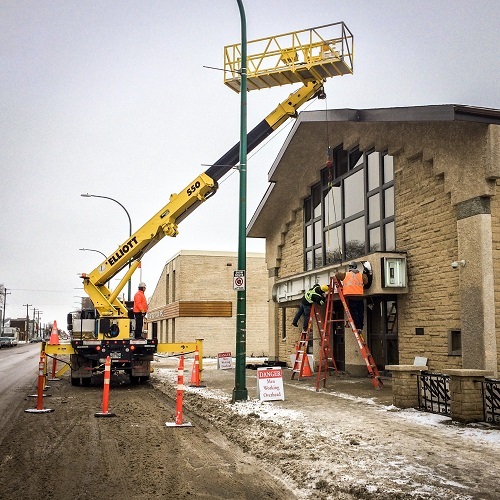 They also provide Winnipeg with auto glass services for windshield replacement and commercial and residential glass repair services for doors and windows. Established in 1968 when Ben and Muriel Berntt purchased Coyles Hardware, located at 555 Osborne Street, where Ben ran a small hardware and glass store. In the early 1970’s Ben moved to a larger location at 308 Morley Ave, establishing Fort Rouge Plate & Auto Glass Ltd in sales. In 1983 Fort Rouge Plate & Auto Glass expanded its operations to 380 Osborne Street. In 2010, Fort Rouge Glass expanded its building at 380 Osborne Street to better serve our customers. In 2017 at there new location 58 South Landing Drive, Oak Bluff, Manitoba the Fort Rouge Glass team looks forward to continuing our excellent customer service as our company continues to grow into the future. 3 Minutes West of Costco on McGillivray Blvd. It's been an amazing 2017 that could not have been achieved without the great clients we had the privilege to partner with and our staff's hard work. Happy Holidays Everyone! Electra Sign and Prairie Sign have been creating high quality, effective signage for over 35 years. With award-winning, certified, and full-service solutions, we are your expert signage partners. Founded in 1978 Me-Dian as the Métis Credit Union of Manitoba, it first was recognized as a "closed bond" credit union. Members of closed bond credit unions share a distinct association based on religion, profession, culture or some other criteria, and nearly every credit union in the province has been closed bond at one time or another. It was in 2009 the doors were widened, welcoming those who are not of aboriginal heritage as associate members of the credit union. Almost 8 years later, Me-Dian Credit Union continues to share their community commitment in celebrating their high standards of service. With this came the request for Electra Sign to assist in their well-known brand by creating custom LED signage. Poised to meet their fast-approaching Grand Opening, Electra Sign committed to removing all previous signage and install new eco-friendly LED illuminated cabinets, channel letters that would showcase their long standing logo and history behind it. On November 20th, 2017 Me-Dian Credit Union and their staff held an open-door ceremony in traditional Metis style while they welcomed members to enjoy the making of new memories. The re-launch included a new online look with the website and local media was on-site for the opening ceremonies. Visit the Me-Dian Credit Union and the great staff today and learn more about the benefits of banking.